Comments Off on In Which the Pirate Weaves in the Ends. In Which the Pirate Finishes the Stripes. Last weekend I went to Maryland Sheep and Wool with my mom! It was a really fun day and I'm glad we made it work out so we could go together. 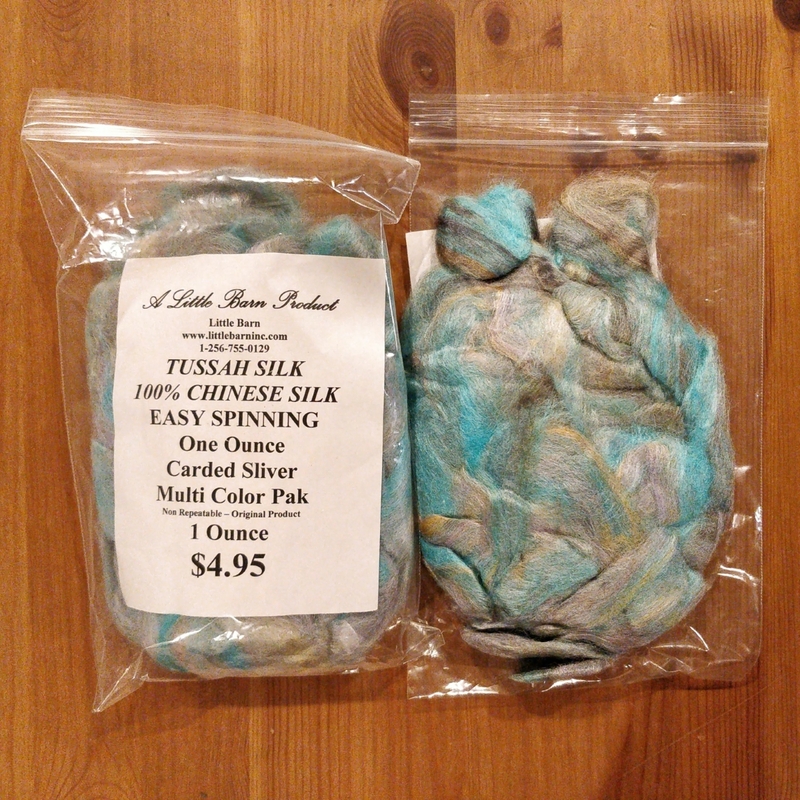 She got a skein of sock yarn in a rich brown, and I got two ounces of this tussah sliver from Little Barn. My plan is to spin it fairly fine and then use it as a lining for my next pair of Fleeps to make them warmer and more wind-blocking. There were so many pretty yarns and fibres there, as usual, and I was tempted to buy some things that I eventually decided to put back. We took quite some time digging through one of the bargain bins and found a bag of sock yarn we liked, but... it was nine 50g balls. That's 4.5 pair of identical socks? Mehhh. I don't want two pair of socks from the same yarn, even if it's nice colours. 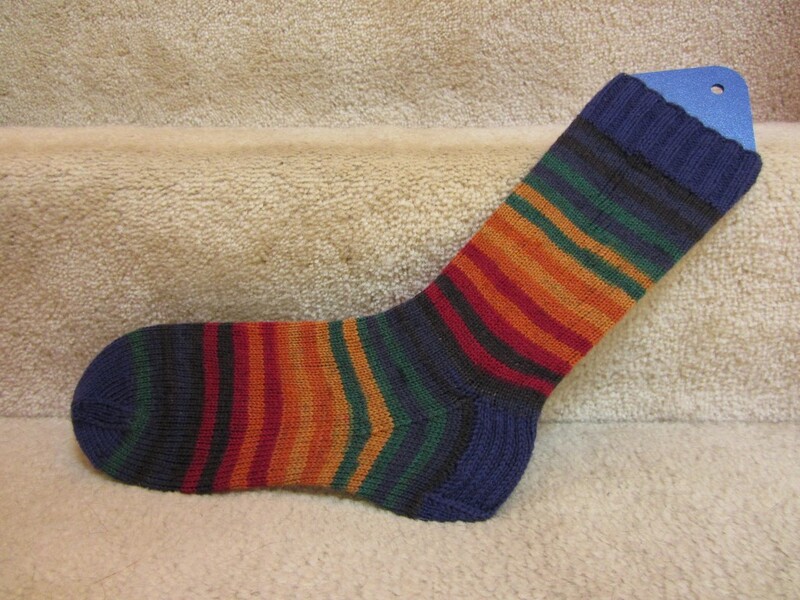 Meanwhile, I've finished the majority of the rainbow striped socks! Here they are, with the ends woven in, and the waste yarn indicating where the heel will be knit in. 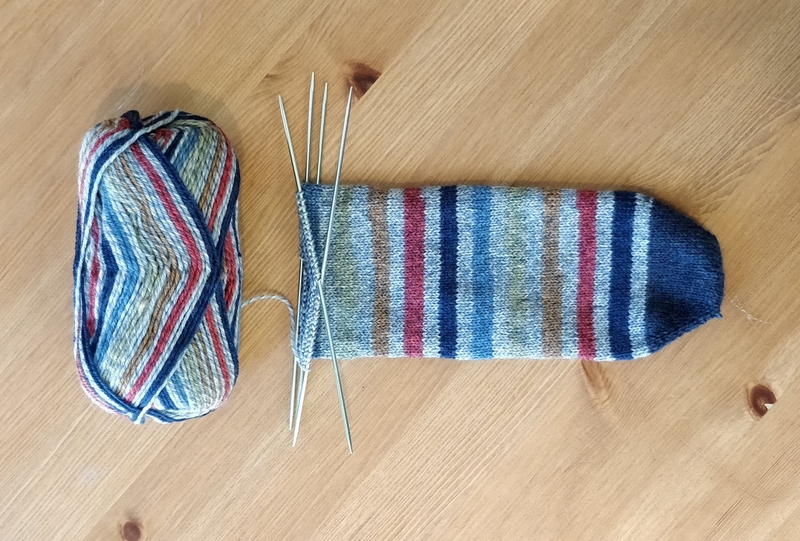 I'm using the instructions from this blog post at Knit Better Socks, and trying the trick of a few short rows to get a little more room in the heel. 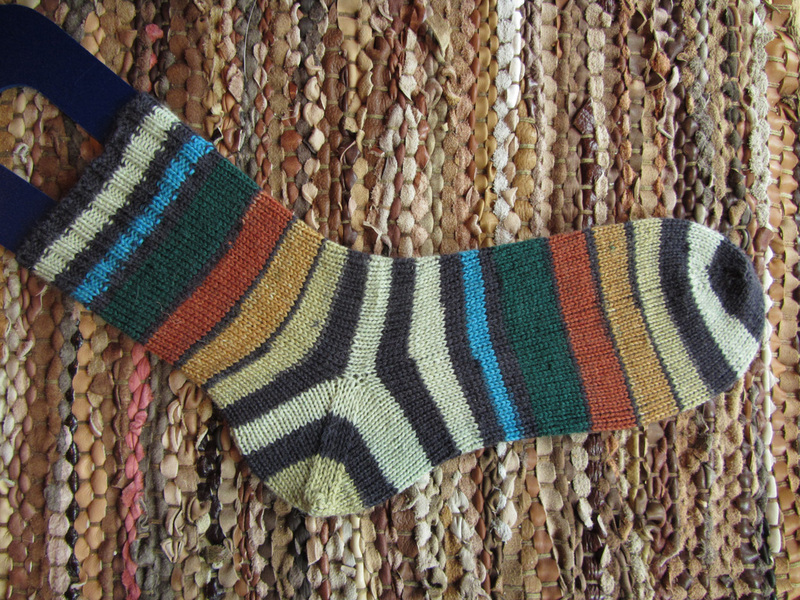 Here I've tried on the sock with a partially knit heel to make sure that it's in the right place (it is) and you can see the little half-moon of short rows in the corner. The solid dark blue yarn is Serenity Sock and honestly I'm not quite happy with it; it's a little thin and a little splitty. Ah well - if the heel wears through, I can pick it out and add another! That's a definite plus to the afterthought heel method. Michael indicated an interest in seeing the process of getting from waste yarn to actual heel, so I'll be saving the second sock to finish the next time he's visiting. He's up to the heel flap of his own second sock, and I'm curious whether he'll want to start another pair after he finishes his first. Comments Off on In Which the Pirate Finishes the Stripes. In Which the Pirate Gets Stripy. 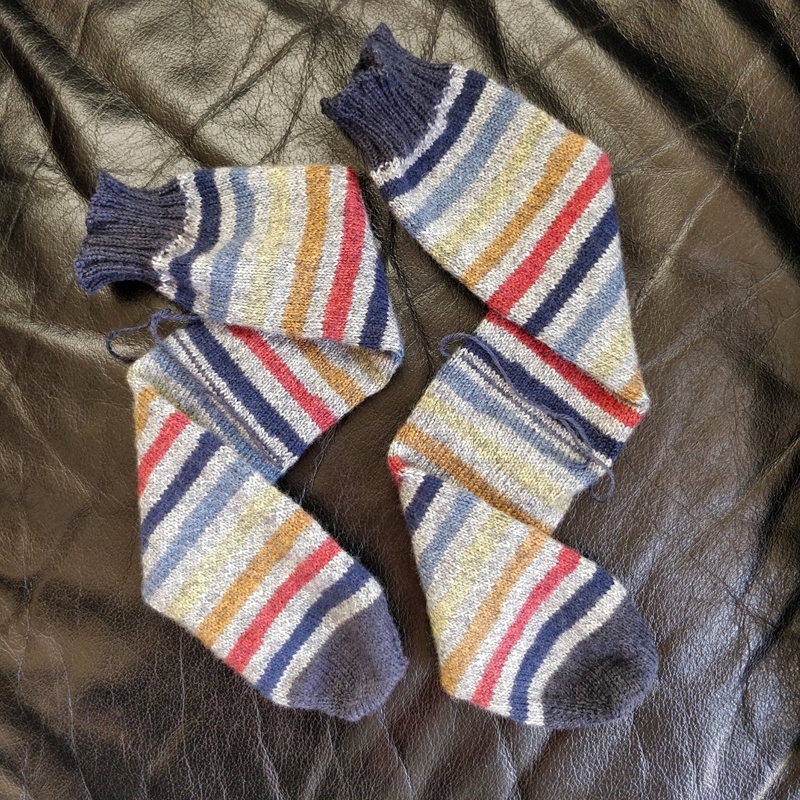 I've knit four pair of socks (pics: one | two | three | four) with Patons Kroy before, and I really like that the yarn is slightly thicker than the usual sock yarn I get. 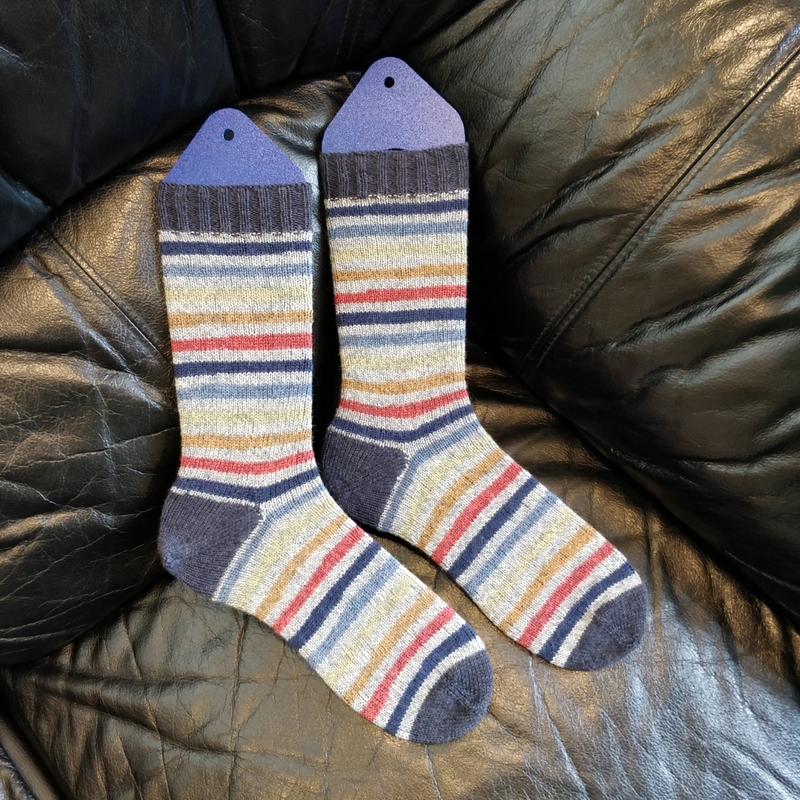 It makes thick cushy socks that still don't feel like they take up too much space in my shoes. 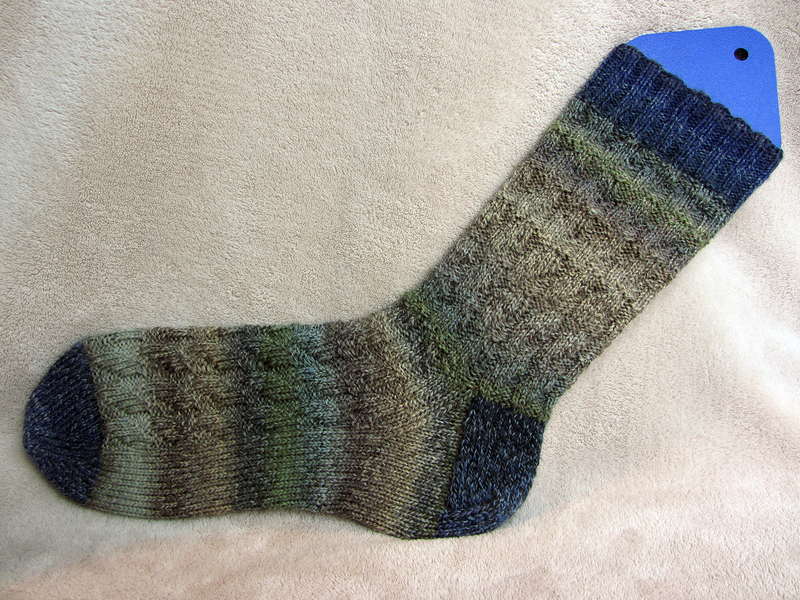 As with all the other Kroy socks I've made, I started this new pair on US 2 (2.75mm) needles and... it was way too loose. Floppy fabric doesn't make good socks at all! What? What is going on! A little internet research affirmed my suspicion that the ragg shades really are a little thinner, more like a standard sock yarn. (Hrmph.) 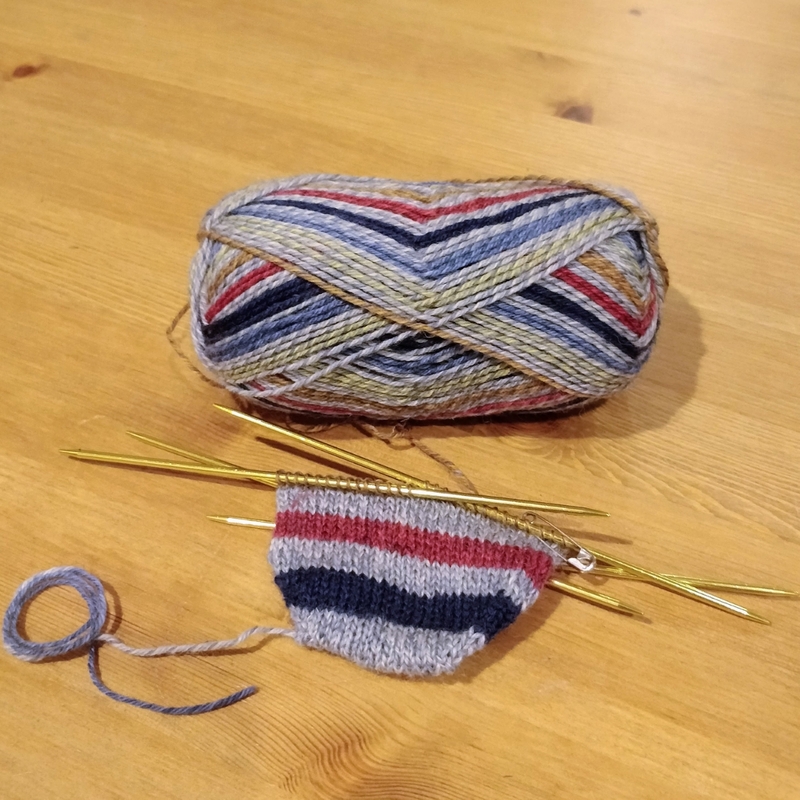 So I ripped out the start of the toe that I had, and began again on US 1 (2.25mm) needles, this time with a navy yarn for the toe. That feels like a much better fabric, for sure, and I like the contrasting colour in the toe better too. This blogpost has some interesting details about the construction of afterthought heels, as well as some hints about improving the fit. 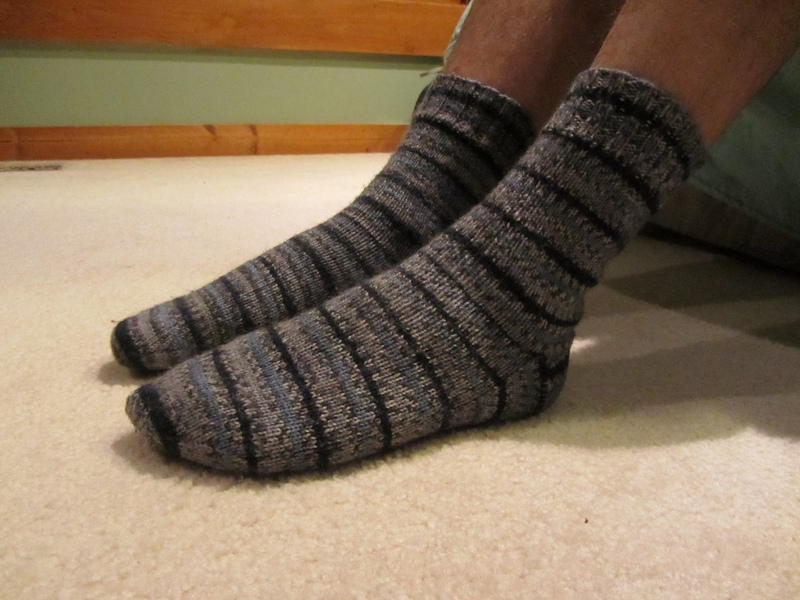 Since there's no gusset in this kind of sock, it can sometimes be a little too tight over the ankle. 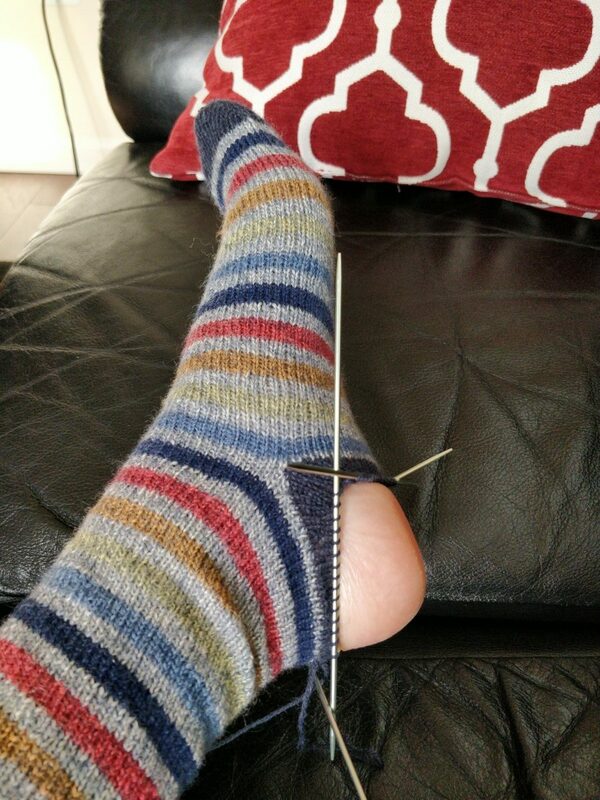 I'm going to try the short-row suggestion and see how well it works for my own foot.